Otolaryngology Update: 10th Congress of The European Laryngological Society, Mardan Palace, Antalya, Turkey on 9 – 12 April, 2014. 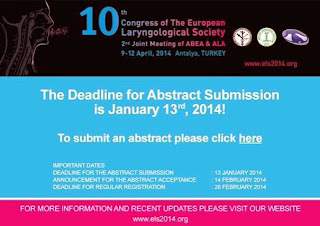 10th Congress of The European Laryngological Society, Mardan Palace, Antalya, Turkey on 9 – 12 April, 2014. 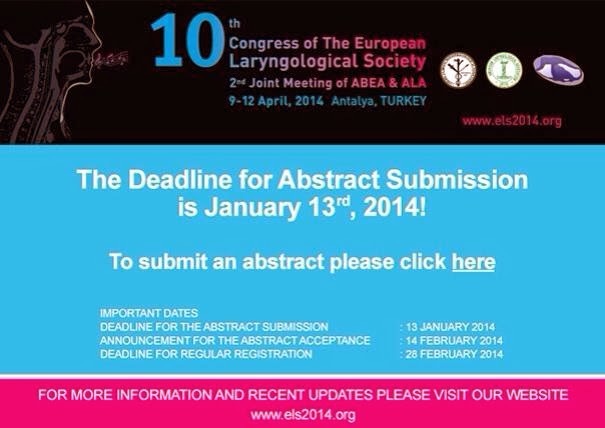 It is with great pleasure that we invite you to the 10th Congress of The European Laryngological Society which will be held in Mardan Palace, Antalya, Turkey on 9 – 12 April, 2014. Antalya, which was known as Turkish Riviera, will welcome 10th Anniversary of biennial congress of ELS in collaboration with American Broncho - Esophagological Association (ABEA) and American Laryngological Association (ALA). Aimed mainly at otolaryngologists but also attracting a wider audience of speech and language therapists, the meeting will feature an outstanding congress of European and US speakers bringing together delegates from all over the world. The meeting will focus on complex airway management, office based procedures, neurolaryngology, voice and dysphagia disorders, and will create a superb platform for scientific, academic and technologic exchange in the field. Congress will include lectures, panel discussions, meet the expert sessions, workshops, oral / poster presentations. In addition to outstanding scientific program being offered, we encourage delegates to enjoy famous cultural heritage and natural beauty of Turkey with our social and cultural events. You also may visit trade congress exhibition to get most updated knowledge on related technology and new systems. We look forward to welcoming you to 10th ELS Congress 2014, which we hope will be an exciting meeting that promises many fruitful discussions.